Seattle WA, March. 11, 2014 – We are delighted to announce that Sporting Seattle FC will play their inaugural season in the NPSL in Admiral. Admiral has earned a reputation as one of the most iconic kit manufacturers around having been suppliers for the England national football team along with clubs such as Manchester United. This new agreement also has special significance for soccer fans in Seattle because the Seattle Sounders wore Admiral when the company was the club's kit suppliers in the original North American Soccer League. The new kit designs will be revealed closer to the start of the season in April. Established in 1914, Admiral started life as a supplier to the British Armed Forces, and has since become a renowned sportswear supplier. A ground-breaking deal came when Admiral agreed a five-year contract with the English FA in 1974 to produce the first commercially available England soccer jersey. Having also supplied the England cricket team, Admiral remains the only ever brand to have appeared on both the English national cricket and soccer teams’ playing kit. Admiral has supplied most of today’s British Premier League and was the largest brand in the original NASL. Today, Admiral is worn by 2012 NASL champions Tampa Bay Rowdies, as well as by 2013 USL PDL Champions Austin Aztex and supplies more NSPL clubs than any other brand. 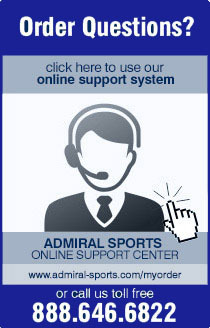 Paul Hamburger – President, 305-704-8081, paul@admiral-sports.com.